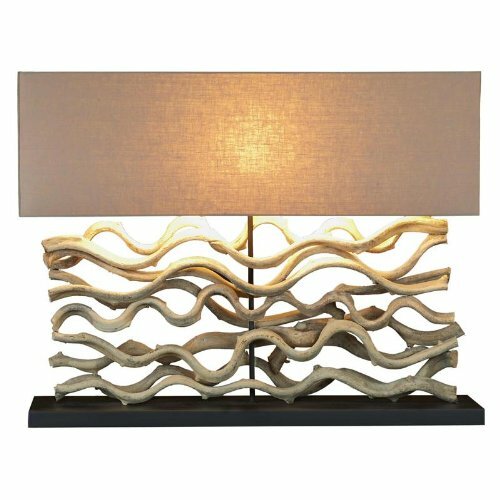 Large Driftwood Vine Sculpture Table Lamp with Course Linen Shade 25-in by Continental Home at Aulainter Americana. MPN: L616. Hurry! Limited time offer. Offer valid only while supplies last. Grace, sophistication and natural coastal style all describe this large table lamp that is as much a statement piece as it is a functional lamp. Grace, sophistication and natural coastal style all describe this large table lamp that is as much a statement piece as it is a functional lamp. Scandinavian design and meticulous craftsmanship result in a truly magnificent lamp for a table, shelf, counter, hutch, buffet or bay window. Constructed of bleached mango wood and arranged randomly - each lamp is hand created and no two are alike. Lamp gives off a warm glow through the rectangular course linen shade and on the wood sculpture below. Wooden black base measures 31-1/2-in wide x 8-in deep Linen shade measures 32-in wide x 10-in tall x 8-in deep Overall height is 25-in One light socket uses standard bulb (60 watts max) Scandinavian design Made in Thailand From Continental Home Important ordering note: This item ships free ONLY within the continental US. Please call for shipping rates to other locations Please make sure to measure the location for your particular application BEFORE you order. Restocking fees will apply to returns of this item. Design Considerations: A wonderful statement sculpture for the home that appreciates the natural beauty of driftwood vines. Suggested commercial applications include restaurants, hotels, offices and waiting rooms to provide functional light and dramatic, natural style. Grace, sophistication and natural coastal style all describe this large table lamp that is as much a statement piece as it is a functional lamp. Scandinavian design and meticulous craftsmanship result in a truly magnificent lamp for a table, shelf, counter, hutch, buffet or bay window. Constructed of bleached mango wood and arranged randomly - each lamp is hand created and no two are alike. Lamp gives off a warm glow through the rectangular course linen shade and on the wood sculpture below. This item ships free ONLY within the continental US. Please call for shipping rates to other locations Please make sure to measure the location for your particular application BEFORE you order. Restocking fees will apply to returns of this item. If you have any questions about this product by Continental Home, contact us by completing and submitting the form below. If you are looking for a specif part number, please include it with your message.